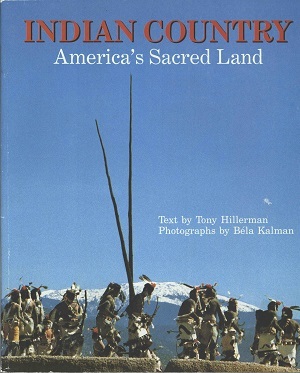 This is the paperback first edition of Indian Country:America'a Sacred Land, a photo-book that explores "Indian Country" in New Mexico and Arizona with Tony Hillerman's text and Béla Kalman's photos. This edition was published in 1987 by Northland Press in Flagstaff, Arizona. The cover features a photo by Béla Kalman of ceremonial dancers descending into a kiva after a San Geronimo ritual at Nambe Pueblo. Format: Paperback, 26.5 x 22.5 cm. Binding: Paper covers with full color photo on front and back.